"Your staff was EXCELLENT; everything was GREAT!!" Rides and Games are a GREAT way to assure everybody has an AMAZING TIME!! and they are FUN, FUN, FUN!!!!! Inflatable Rides: From smaller Bounce Houses to Giant Inflatable Slides, there is a HUGE?variety of these attractions. Many sizes can accomidate everything from smaller house parties to large festivals. 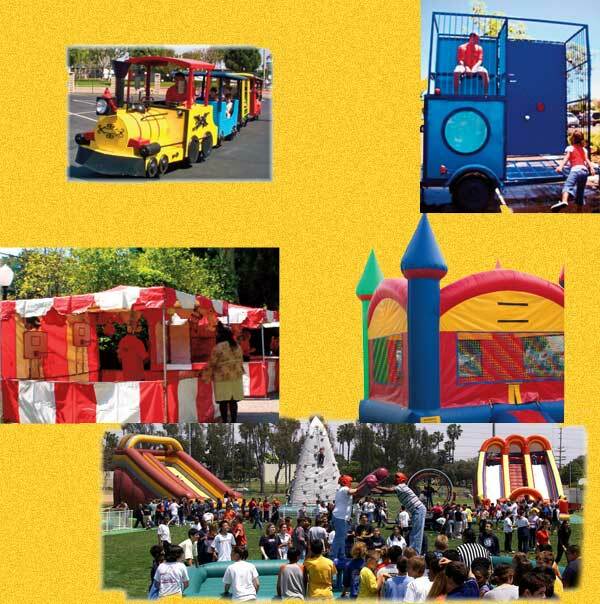 Carnival Rides: Trains, Dunk Tanks, Carousels, and MANY OTHER RIDES will transform your event into a carnival. Game Booths: We have a selection of midway games to complete that circus or carnival atmosphere. If you find our extensive list overwhelming, PLEASE give us a call. Our staff is ready to assist you in designing your event! !